The first procession took place 115 years ago to celebrate the Diamond Jubilee of Queen Victoria. 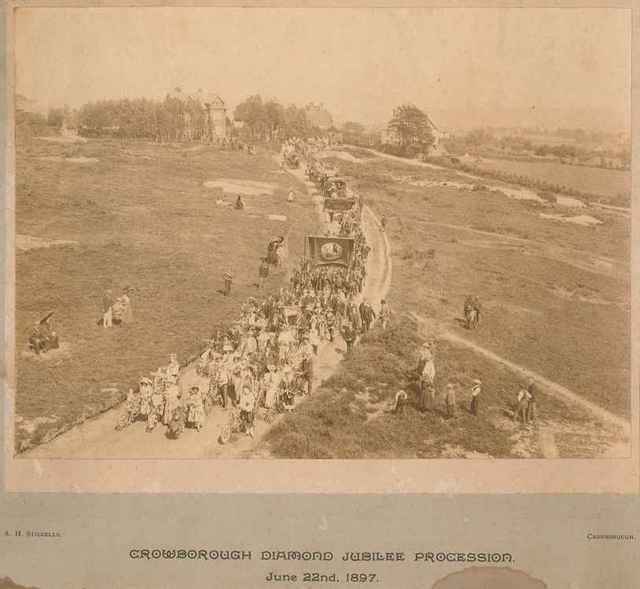 The photograph shows part of these celebrations, a procession which travelled along South View Road on 22nd June 1897. The photograph was taken from the first Clubhouse of Crowborough Beacon Golf Club just two years after it had been founded in 1895. The bench to the left of the picture is still in existence today and is now the only point along South View Road where the public can enjoy the view south. The rest of the view is now obscured by trees and housing that has grown up since the last Diamond Jubilee.